Light up the room with impressively personalised lamp shades and let your personality shine. Available as a ceiling or table lamp shade in four different sizes, you can create a range of them to decorate your entire home. Print your photos, quirky designs or even text to make truly unique lamp shades. Our drum lampshades, UK, are made from a translucent, slightly textured matte fabric that looks stunning when lit up from within. Our four sizing options include three round drums and one small oval, so you can really tailor it to your home décor needs. Whether you've got unique artwork or a family photo you want to show off, your home will be that little bit brighter with personalised lamp shades. I bought a 40cm ceiling drum Lampshade with my own design on it and it arrived within 2 days with exceptional printing, quality and craftsmanship. Very pleased with the professionalism of it. thank you. Good quality product, arrived well packaged and within timescale. Care: Regularly dust to keep the photos vibrant. When the lamp is on, keep liquids away from the bulb and plug socket. Like many of our products, the printed lamp shades come with a quantity discount, so buy one for each room today and save money. For Your Safety: Inner layer is a BS standard fire rated material - BS EN 60598 - 1:2008 650 Glow wire test (clause 13.3.2) only. For the smaller sizes - 20 cm round and oval - the maximum wattage is a 40w bulb. For all other sizes, use 60w-100w bulbs but we recommend cool energy saving bulbs for all our lampshades. Your photo or design is wrapped around the drum with full-colour edge-to-edge printing. The fabric we use is stiff, matte, translucent with a slightly textured finish, giving your unique lampshades an authentic look. Turn on the light and enjoy seeing the soft glow through the shade. Even with the light off, your photos are still vivid. Your shade will come with a removable adaptor to alter the size of the fitting ring, as displayed in the image above. All lampshades are UK made by hand in London. Your photos or design are printed onto our semi-translucent fabric and then backed with a fire rated lining. Edge-to-edge printing all over with a white painted metal frame at the top or bottom depending on whether it's a ceiling or table lamp shade. Customise our round lampshades as a gift for your son or grandson. Printed with their favourite comic book hero or sports club, their bedroom will be totally unique to them and their interests. You could even let them design their own and watch their imagination go wild. To congratulate the newlywed couple, gift them with a personalised lamp shade featuring special photos from the big day. Not your average wedding present, it'll stand out from the rest and also illuminate their home with happy memories. 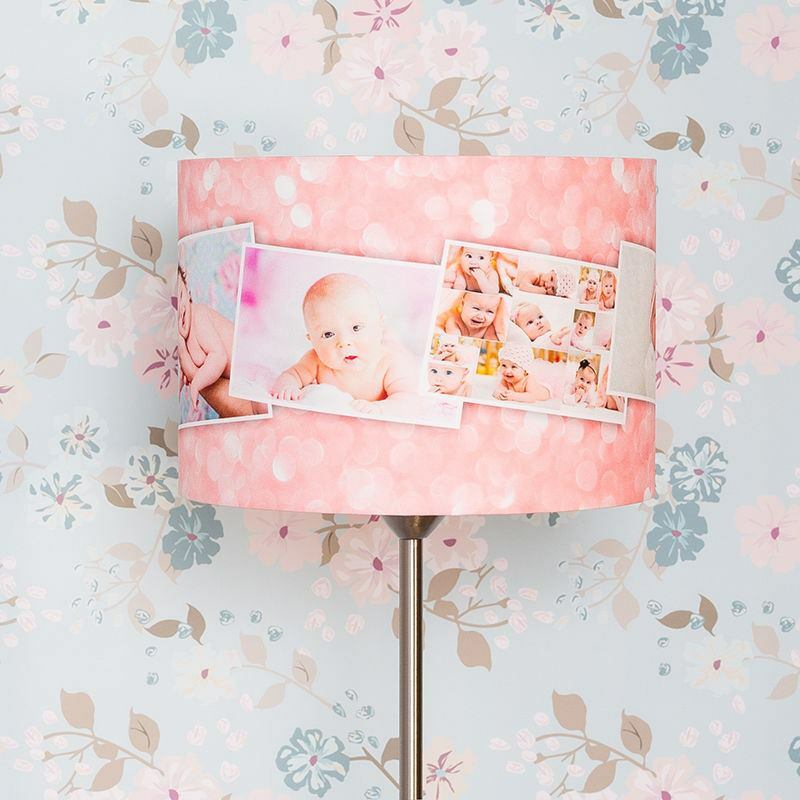 Check out our awesome personalised photo lampshades - with one click you can light up four customisable sides!